Telephone call recording adaptors to allow you to professionally record your telephone calls to a computer or other recording device. Easy (DIY) installation and low equipment cost, make the Trillium Recording Adaptors the ideal phone recording solution for small to medium size businesses e.g SOHO, accountants, insurance brokers, call centers, telemarketing, sales, legal practitioners, journalists etc. Regardless of which telephone or phone system you are using, we have a suitable phone recorder for your application. Telephone Recording Adaptor jack with 3.5mm plug. Allows you to connect your phone to your recording device via the 4-wire handset connector. This recording adapter is suitable for recording calls on most telephones with detachable handsets, including analogue telephones and most digital telephone extensions. Does not require batteries or Plug Pack. 2.0m shielded lead with 3.5mm Stereo Phono Plug. 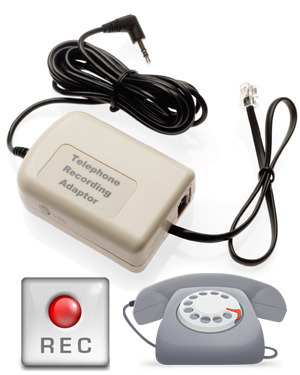 Telephone Recording Adaptor allows you to connect your telephone to your PC or Recording device to record telephone conversations. The adapter is easily connected to any telephone with a detachable handset. The Recording Adaptor is ideal for recording telephone conversations, for later reference, to confirm details of the conversation, such as; the order quantity, agreed price, name, telephone number, address or credit card details. It is also extremely useful for recording telephone interviews and conference calls for later transcription or minute taking. It is a valuable training tool, allowing you to record sales and customer service calls for later analysis to enable you to develop appropriate training for Customer Contact staff.